Simple Hands: Rainy Day and Allergic Reactions. Rainy Day and Allergic Reactions. Wednesday was rainy and I wasn't feeling too hot when we first got up so I was concerned about the days activities. Luckily we had a morning play date so that took care of a good chunk of time. 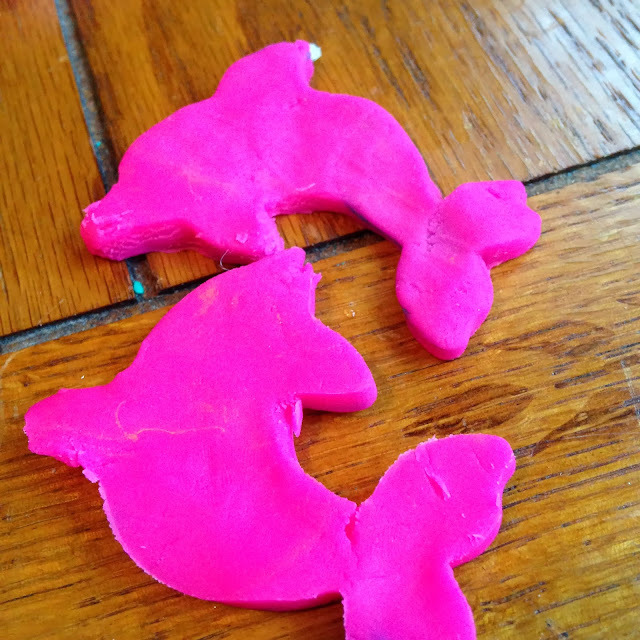 Lately O has been pretty obsessed with Playdoh. He needs to make cookies, carrots, and people like everyday. 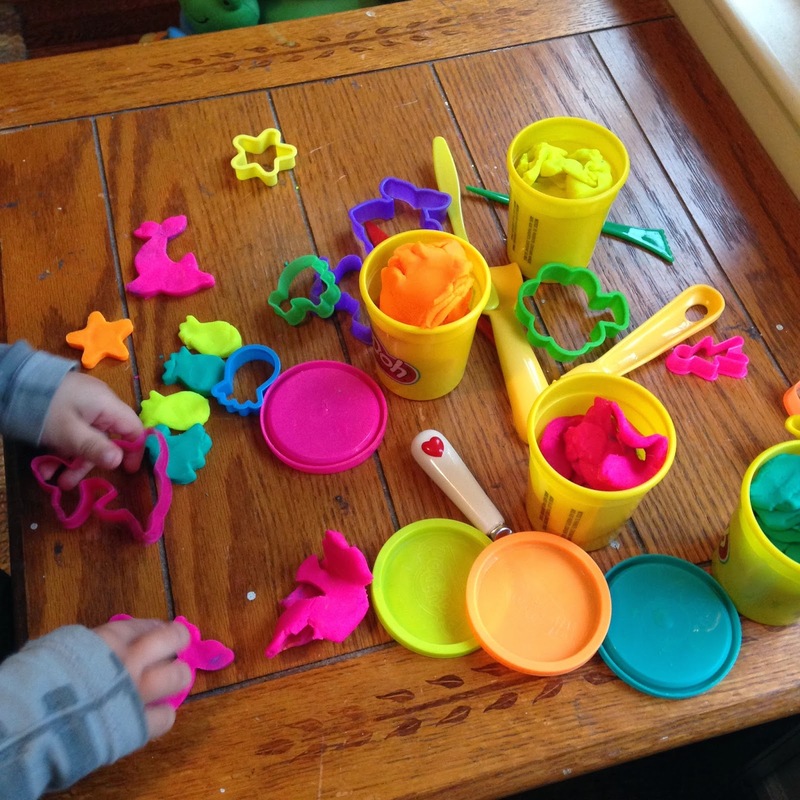 We have a fun set of cookie cutters that make the play time even more fun for him plus the bright colors cheered up the dreary day. He was pretty proud of his creations and helped take some pictures to document the fun. He's my son alright. The funny thing about the cookie cutters is that he can't quite recognize all of the shapes until he uses them. He was pretty serious about the above animal being a kangaroo, he had it hopping all over the room until suddenly he realized it was a dolphin. Suddenly meaning I had told him that initially but I guess he thought I was wrong. We hit up the grocery later and picked out a pineapple to have with lunch. He diligently cut it up with me with his little spreading knife and like any good chef was sampling along the way. I had no cause for concern since we've had pineapple before. But suddenly after having a healthy serving he started to yell that his tongue was hurting and kind of freaking out. I looked in his mouth to see some large bumps forming on the back of his tongue. No tongue swelling but he was clearly uncomfortable. So naturally I called my mom, then the advice nurse. I have enough sense to know it wasn't life threatening at that point but it was kind of scary anyway. We calmed down, cooled his tongue with a combo of things and safely ended the mild reaction. I wasn't expecting it so it seemed scary and I was nervous about his nap, but he was fine and was able to eat comfortably by dinner. Yikes! I've heard awful food allergy stories and I know this one was pretty tame but I wanted to share it anyway. We've got another fun weekend coming up...this mama is turning 35 on Sunday. Have a great weekend and steer clear of really acidic pineapple! Auh yes, I remember those fun days of keeping my boys entertained, well nourished and teaching them along the way. Funny thing as a mom, you never want to stop entertaining, nourishing and nurturing them. Chris and Spencer are home for the weekend so Doug and I have decided to scare the college boys by taking them to Fright Night at Cedar Point. Kind of like Play Dough but on a different level. Have a great weekend andHappy Birthday!